Chicken Corn Soup is a Pennsylvania Dutch invention. If I had to choose a favorite soup my mom makes, it would be a dead tie between Chicken Corn and Beef Vegetable. Traditionally, Chicken Corn Soup has small dumplings boiled in it that my mom calls “rivels,” but I’ve never perfected the rivel, and now try to avoid too many carbs, so a meat and vegetable soup is right where I want to be. I’ve included the optional dumpling recipe at the end. 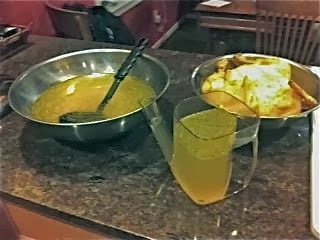 I start with my own chicken and broth. You can always skip this step by boiling or poaching some 3-4 bone-in chicken breasts and buying 96 oz. or more canned chicken broth. 4 cups or more good quality frozen corn, or fresh cooked corn cut from the cob. Place chicken in a large pot. Fill pot with cold water until chicken is almost covered. Add everything but the corn. Bring to a boil. Simmer for 1-1/2 hours. Remove chicken from broth and set aside to cool. Strain broth through a colander. At this point I use a fat separator pitcher (see photo) to remove the fat. I pour the broth from the pitcher through a fine sieve to remove smaller bits from the broth. You can also line your colander with cheesecloth if you prefer, and remove the fat by spooning from the top of the broth. Return the strained broth to the pot and add bouillon. Place pot on medium heat. When chicken is cool enough to handle, remove the meat and cut into small bite-sized pieces. Add to the broth. Bring to a simmer again. Add the corn and the broth until you have a ratio you like. Add the parsley, and salt and pepper to taste. I have, in the past, added shredded carrots for color and more nutrition but it changed the taste enough that I no longer do. Still, it is a thought if you want more veggies. If you really want some carbs, you can add cooked small pasta like ditalini or orzo, or follow the rivel recipe below. Place flour and salt in a bowl. In a separate bowl, whisk egg and water together. Add the egg mixture to a flour and stir to combine. Drop pea-sized pieces of the dough into simmering soup. I hope you enjoy this tradition Pennsylvania soup!